This 2-piece toilet from Crane Plumbing is a great way to upgrade your bathroom. Designed to save water and money, this single-flush system is an amazing feature. Its durable vitreous china design will keep your bathroom looking beautiful, flush after flush. Delta toilets are the smart choice. This Prelude 2-piece round-front toilet in white is beautifully designed for easy installation, maximum flush and water savings. All Delta toilets feature the exclusive SmartFit tank-to-bowl connection. This technology eliminates potential leak points and the fear of over-tightening bolts - all while adding stability to the tank simplifying the installation process. 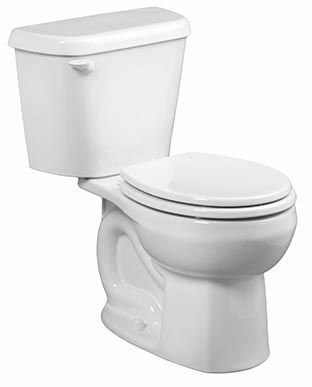 The Prelude round-front bowl offers a classic design, comfortable chair height and maximum flushing performance. At 1.28 gpf (4.8 lpf), this WaterSense-approved model provides significant water savings without sacrificing performance. No additional tools are required to assemble and install this complete toilet. Sophisticated yet simple, the Foremost Matera wall hung toilet will add a stylish element to your bathroom. Made from high quality grade A vitreous china, the white Matera is an HET toilet with a compact, round front bowl and white dual flush activator mounted in the wall. Coordinate with a wall hung vanity to create a modern bath suite with significant appeal. Or, partner with a traditional vanity for a beautiful bathroom with an eclectic touch. Featuring a fully glazed 2-1/2 in. trapway, the Matera has washdown flushing action and includes a Duroplast quick removal slow close toilet seat. Also available in store by special order only see store for details. The Glacier Bay 4.8LPF 2-Piece High Efficiency Round Front Toilet in White is manufactured from durable vitreous china, which is resistant to stains, acid and abrasions for long-lasting beauty. This 2-piece toilet has a separate bowl and tank. A plastic toilet seat and wax ring with floor mounting bolt set are included. The round front bowl can fit easily in most bathrooms. The white colour can blend with many bathroom styles. Crane 2-Piece Single-Flush Round Bowl Toilet This 2-piece toilet from Crane Plumbing is a great way to upgrade your bathroom. Designed to save water and money, this single-flush system is an amazing feature. Its durable vitreous china design will keep your bathroom looking beautiful, flush after flush.